12th/13th Centuries The origin of ‘Customs’ can be traced back to the 12th/13th centuries where it is referenced in the Magna Carta, as a long-standing term for the collection of duties on imports. 1810-15 Smugglers’ lookouts built at Barrenjoey and La Perouse in New South Wales. 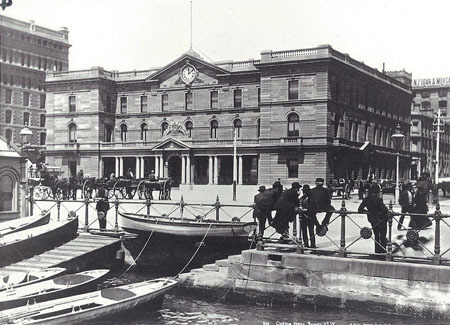 1845 Construction is completed on the first Customs House in Circular Quay, Sydney. 1853 Customs Consolidation Act – gives effect to Australian colonies taking responsibility for their own Customs, previously administered by England. 1854 A showdown between New South Wales and Victorian Customs officers occurs at Echuca, but conflict is avoided due the strong negotiating skills of the commanding officers involved. 1872 Edith Hanson, widely considered to be the first female Customs employee, joins the New South Wales Customs Department as a “typewriter”. March 1883 Northern Territory Sub-collector Alfred Searcy conducts a patrol in the chartered cutter Silver Cloud to advise Malay fishing vessels on the Australian coast that they must be licensed and pay duty on the products they take. On his second voyage in Silver Cloud, Searcy collects duty levied on the catch on 3 Malay vessels he encounters on 26 December 1883. 1885-1887 Searcy draws up tariffs and initiates the collection of license fees from macassan trepangers (fishermen). Searcy’s 1887 tariff is used as a model for the first federal tariff in 1901. It is said that by the time Searcy left the Territory in 1896, it was largely subdued due to the efforts of the swashbuckling Searcy and staff.